The first thing that discourages builders around the Europe from building the W1GHZ transverters is the different band plan on the 13cm and 9cm. Moreover some countries can not even operate on the 9cm band. Some counties, like Croatia can use the both portion of the band (2304 & 2320 up to 2450 MHz) but all activity is concentrated around the 2320 MHz. Using the originally designed oscillator is not of much help. The problem can be solved using the lately wide spread oscillators based on the Si4133 synthesizer with direct L.O. frequency for the 23cm and 13cm bands. The oscillator can generate the frequencies between 400 and 1900 MHz what he is OK for the 432 MHz I.F. on the 13cm band. Of course, this is no more simple and cheap project, but just an option for the builders. The one I have is coming from Australia, offering 16 different pre programmed frequencies, with possibility to reprogram any required frequency in the mentioned range with the step of 1 MHz. DEMI is offering their version (ApolLo) of the oscillator based on the same synthesizer. As I plan to use this synthesizer for another 6cm transverter project, the same was replaced with the old fashioned L.O. based on the crystal oscillator with the chain of multipliers. Already proved S53MV oscillator design, the same one in use in the 23cm simple beacon, was assembled also for this project. After choosing the I.F. of 432 MHz, the required L.O. frequency was 1888 MHz. Approach was simple, first generating the signal of 629.333 MHz and than multiplying the same to 1888 MHz. The oscillator multiplying factor is 36 (3 x 3 x 2 x 2) with the crystal oscillating on the 17.481 MHz. This is where all your odd frequency crystals ripped out from the old service mobile radios are coming handy and finally useful. If you have an inventory list of all your crystals you will have in no time the right one ready. If you do not have the list, you will have in no time your fingers dirty digging out for the right one :-) . The final VXO oscillator frequency can be tuned quite wide, so the crystal frequency does not have to be exactly as the required one, making easier to look for the right one. 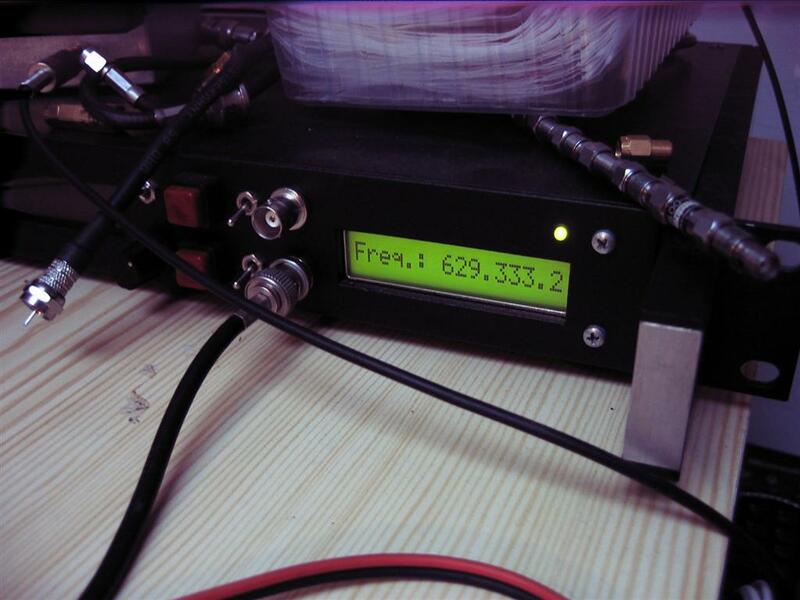 After a minute or two the frequency is very stable despite the the big multiplier factor. 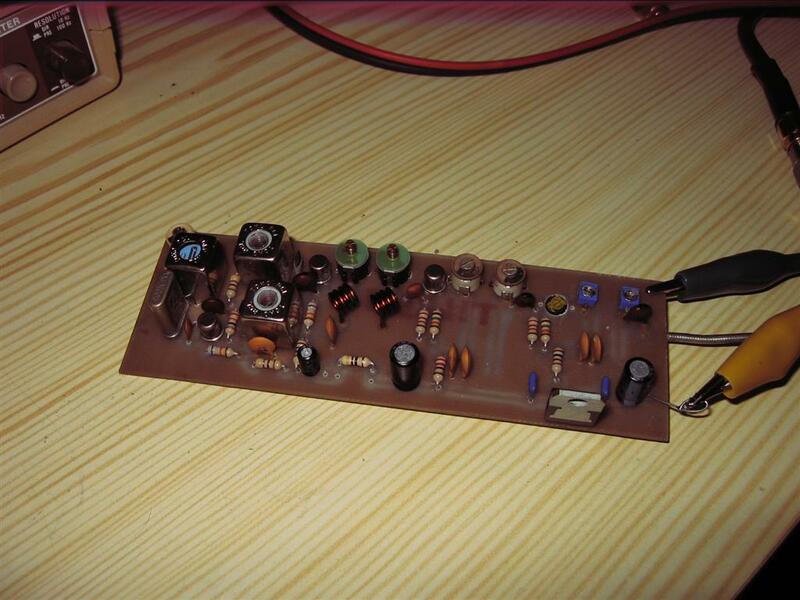 The same principle and oscillator was used in many projects. The first 720 MHz oscillator for the 23cm rover transverter was the same one. Multiplying the 20 MHz crystal from the old hard disc was easy. 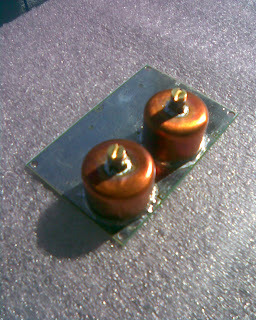 Multiplying the 18 MHz computer grade crystal was used in the 23cm simple beacon project and the next 13cm rover transverter will have the same oscillator. Driving directly the transverter board with the 629 MHz seems to be a nice idea, but I was not sure that 1" pipe-cap filter can tune efficinetly down to 1888 MHz. Some experimenting and tuning was required on the pipe-cap filter and for that reason I decide to use another (no tune) multiplier. The S53MV Beacon 99 script is full of designs that can be used for such multiplier. 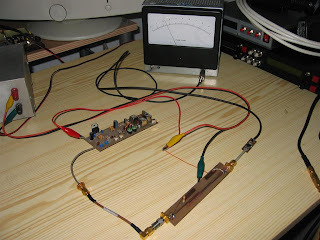 I decide to use the oscillator multiplier from the ZIF SSB transceiver for the 9cm band (3400 MHz). The same article is also showing the oscillator that I am using for most of my simple projects.I knew that the filter in the multiplier chain is designed for the 1700 MHz, but I expect not so sharp filter response due to the design. The original design suffer a minor modification on the first stage where ATF35376 was replaced with the simple SNA-386 mmic from Sirenza. I just don't like this HEMT devices.Of course, the bias network was changed as well and the gate resistor was removed also. Idea was to saturate the MMIC to get enough harmonics, filter the 3rd one and amplify the 1888 MHz signal with the BFP420 transistor. I drive the SNA-386 with the 6dBm from the 629 MHz oscillator. At the end I was happy with the 14dBm of the signal on the 1888 MHz. 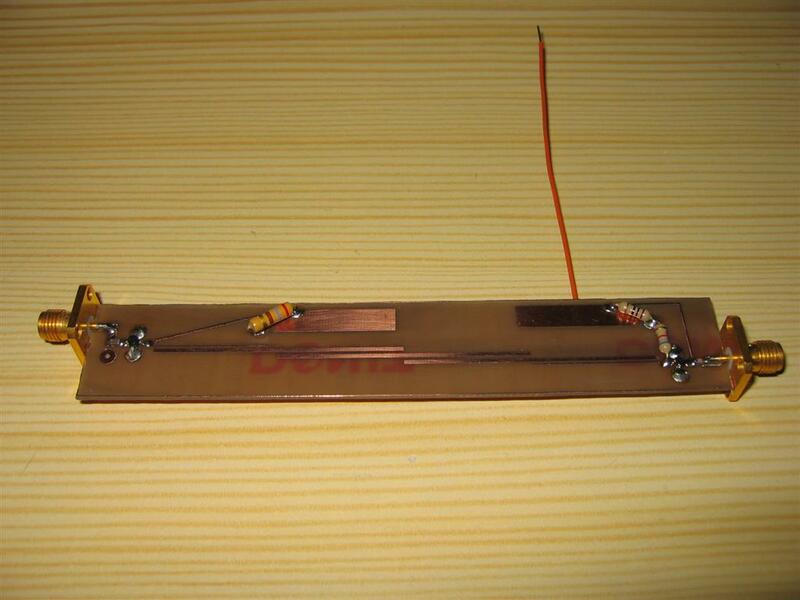 The multiplier was assembled on the 0.8mm FR4 laminate where no tuning was required. After the initial tests the SMA attenuator was replaced with the SMD resistor network just before the SNA-386 on the PCB. Vias required for the MMIC and BFG420 grounding are replaced with the grounding done by drilling the 2.5 mm holes filled with the melted solder wire. 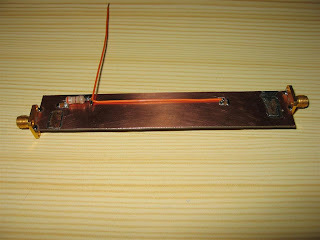 The ground side of the PCB is covered with a peace of thin copper foil soldered for the PCB creating a good connection with the pins. Once I had the oscillator and multiplier ready and running properly the rest was easy. As I ordered a few rover PCBs it was just about following the Paul's procedure. There was no need to solder the original multiplier part with two pipe-caps just the part from the mixer and the front end. First, two 1" pipe-caps were soldered using the flat iron technique and they are separately tuned to 2320 MHz using the procedure explained in the 13cm Pipe-cap filter post. Soldering the pipe-cap may be tricky if you are using just a low power soldering iron. 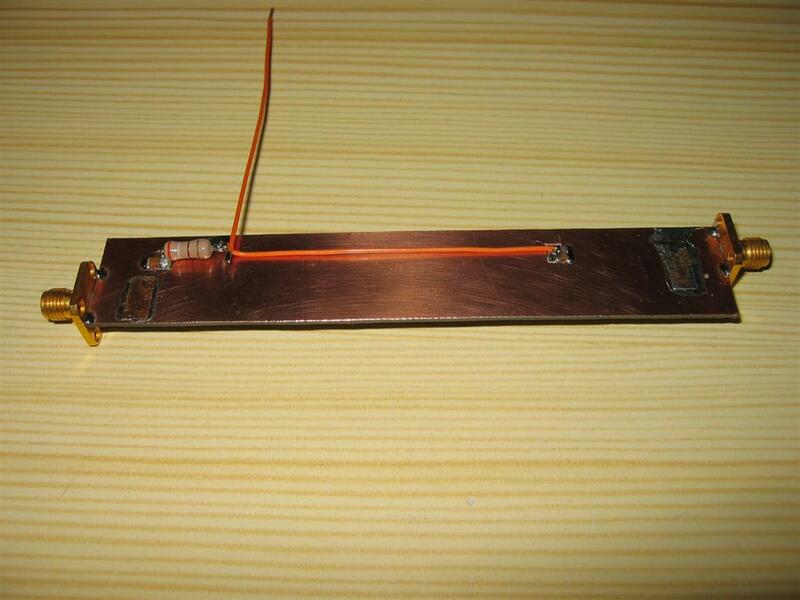 On the other side if you are using high power iron, the job may look ugly and the PCB can be damaged as well. I prefer to preheat the pipe caps on the flat iron and to position one by one using the tweezers on the marked place on the PCB. Than you can use your standard soldering iron to properly solder the pipe-cap for the ground side of the board. Soldering the RX and the TX front was quick and the only thing you have to care is the position of the MMIC blocking capacitors. I was short of MGA-86567 and instead I install the MGA-86563, the first I found in my drawer with the similar characteristics. The PCB is just enough small to fit SOT-363 (SC-70) surface mount package. Connecting the L.O. and a FT-817d with the transverter board with a peace of semi-rigid coax was enough for the first RX test. Everything was looking OK and the MMIC current was by the specs. I checked the rx part tuning the filter pipe-cap to the maximum signal transmitted using the alias frequency from my AD9951 DDS oscillator. To check the TX side i just insert the 25dB attenuator before the mixer I.F. port and the TX was pushing out 40 mW. It seams that Sirenza SNA-586 was running by the specs. delivering the max. output P1dB power. Initial tuning with the antenna was with the transverter assembled in the old PC switching power supply. Just a small power amplifier using the AH-102A MMIC delivering almost 27 dBm of power is hiding bellow the orange heat-sink This will help to check the TX part running some more power to the antenna. This setup can not be used outdoor, so another w/tight housing was prepared with more room to accommodate a bigger power amplifier. The same one can be mounted on the mast, just behind or close to the antenna to reduce the loss of the signal in the coaxial cable. Looking from the top, there is a 629 MHz oscillator followed by the x3 multiplier stage. Below the multiplier there is well known transverter board. From the TX SMA connector on the left side the semi-rigid cable is connected to the power amplifier while from the RX SMA connector the semi-rigid is connecting the commercial 13cm 25dB preamplifier. At the bottom the coaxial relay is connected to the amplifiers and the antenna connector. Dummy proof sequencer is positioned on the left side of the housing assuring the carrier or PTT operating mode. The transverter was tested from the home and the portable location. With only 450mW and 90cm dish antenna with the WA5VJB log. per. feed the contacts up to 250 km were established during the winter time. The summer will bring more activity, better propagation and some ducting as well. The video is showing the 200 km qso on 2320.100 MHz with the Italian station. 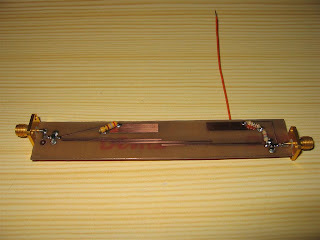 13cm band was used as a talk-back frequency trying to establish the contact on the 10 GHz. The same principle will be used for the 9cm W1GHZ rover transverter. Oscillator is almost ready and the original multiplier on the transverter board will be used, avoiding the extra multiplier.